it is even possible for an object to orbit around... something that has no mass at all! (Here, there be dragons Lagrange Points). 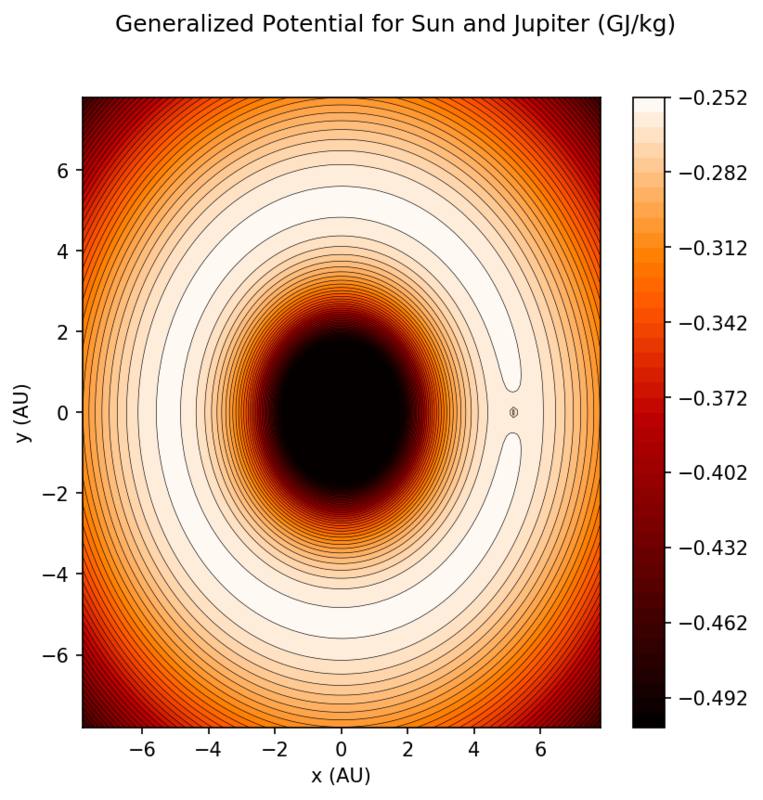 Could I place the Moon (or a moon in general) to the Lagrangian point between the planet and the parent sun so it casts a permanent solar eclipse shadow on the planet? It would be more like a transit in case of Earth, since the L1 point is too far from Earth for a total eclipse. You wouldn't be able to keep it there for very long without some active pushing, because the L1 (also L2 and L3) are unstable points. They act like the tops of hills, and an object placed on one will tend to "roll off". The L4 and L5 points however are stable and you can get orbits around them, but they don't lie on the line between the Sun and the planet. We do use the Lagrange points for some observing satellites. The WMAP and Planck satellites which observed the cosmic microwave background were placed at L2 (again kept there with some regular small thrusts). Sometimes asteroids also get caught up in the L4 and L5 points -- so called 'Trojan asteroids'. Jupiter has a lot of them, and one has even been discovered at Earth's L4 point. [quote="Watsisname"]You wouldn't be able to keep it there for very long without some active pushing, because the L1 (also L2 and L3) are unstable points. They act like the tops of hills, and an object placed on one will tend to "roll off". The L4 and L5 points however are stable and you can get orbits around them, but they don't lie on the line between the Sun and the planet. We do use the Lagrange points for some observing satellites. 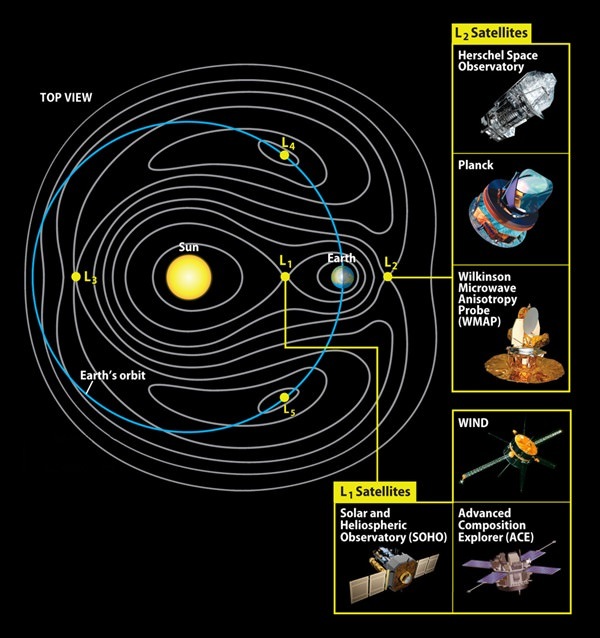 The WMAP and Planck satellites which observed the cosmic microwave background were placed at L2 (again kept there with some regular small thrusts). Sometimes asteroids also get caught up in the L4 and L5 points -- so called [url=https://en.wikipedia.org/wiki/Trojan_(astronomy)#Trojan_minor_planets]'Trojan asteroids'[/url]. Jupiter has a lot of them, and one has even been discovered at Earth's L4 point. What are those white curves? Source of the post What are those white curves? Equipotential lines. The generalized "gravitational" force in one line is of the same magnitude in each point of the same white line and the direction of the force is perpendicular to those lines in each point. They are like contour lines in topographic maps but the landscape here is the generalized potential not a mountain. If the lines are close toghether, that means that the slope of the mountain is very pronunced (in our case the slope of the potential dwell). Sorry, I delayed my response/explanation on the Moon been more strongly pulled by the Sun than Earth because I'm trying to reproduce the curves of the residuals in Uranus's perturbations. I just want to ask Watsaisname some things and see if I can comprehend exactly what's going on with that curve (as you can see I'm still not fully satisfied with this) so I'm integrating it with different conditions and trying to build an education animation. If it takes me too long I will adress the Hill sphere before that (and then I will return to my promised tides explanation, and after that I'm probably going to shut up for a while because I know very little and also would like to here others). Indeed I have been working on it and have a pretty good idea of what to discuss, but making the write-up will take some time. Your quick explanation of the contours is excellent by the way! Good comparison with topographic maps, and the "landscape" of the potential. It is also true that there is a lot more detail to cover with the topic, and it gets very surprising and fascinating! Hopefully I'll have something before too long, but by all means go ahead with the strength of Solar vs. Earth gravitational pull on the Moon and the Hill Sphere first if you have the opportunity. Source of the post... and it gets very surprising and fascinating! 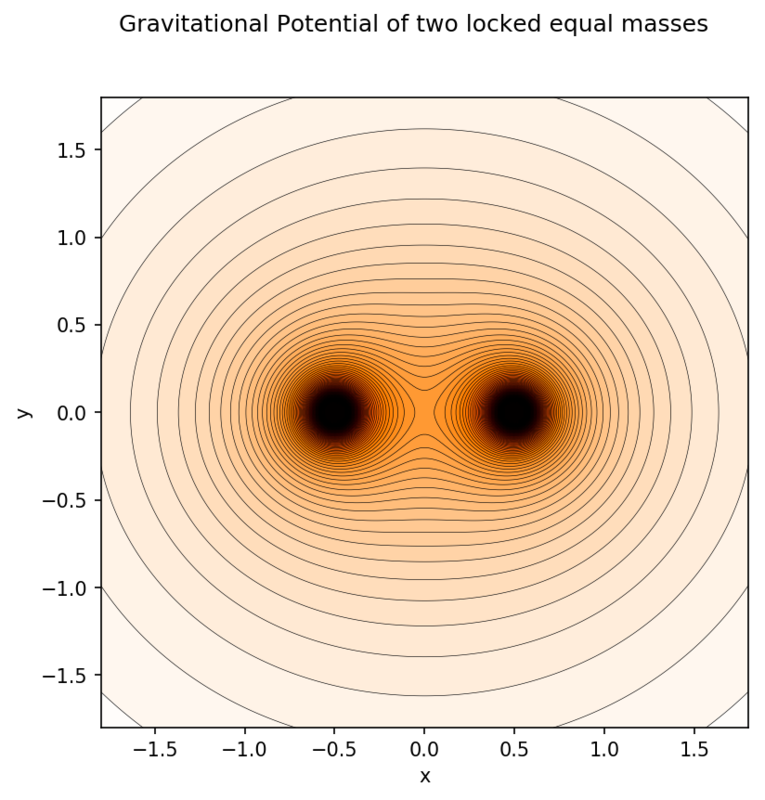 When two masses move in a circular orbit about each other, five points of gravitational equilibrium are generated, which move along with them. A particle placed at one of these points will have a very small acceleration, as if gravity was in some way cancelled out. More strangely still, it can be possible to place a particle in a stable orbit around some of these points, despite there being no mass there to attract it! These five special locations are known as the Lagrange Points, discovered by Leonhard Euler and Joseph-Louis Lagrange in the 18th century. Not only are they of special interest in celestial mechanics, they also have important applications for space missions and the placing of satellites. We even find asteroids caught around some of the Lagrange points: so called "Trojan asteroids". Why do these points exist? To investigate, we will again use the concept of a potential, as we saw in the discussion of Mercury's orbital precession. As a reminder, in physics a "potential" is an imagined landscape of hills and valleys that describes how an object reacts to forces. We can think of an orbit as being the motion of a particle trapped in a valley of a potential. This time however, we will generate the potential in a somewhat unusual way: we will adopt a frame of reference which is rotating. There are pros and cons to this approach. One one hand, motion in a rotating frame of reference is not very intuitive, and we will need to invoke "non-inertial" forces to understand them. On the other hand, doing it this way will make life a lot simpler, as then the masses and the Lagrange points themselves will appear stationary. 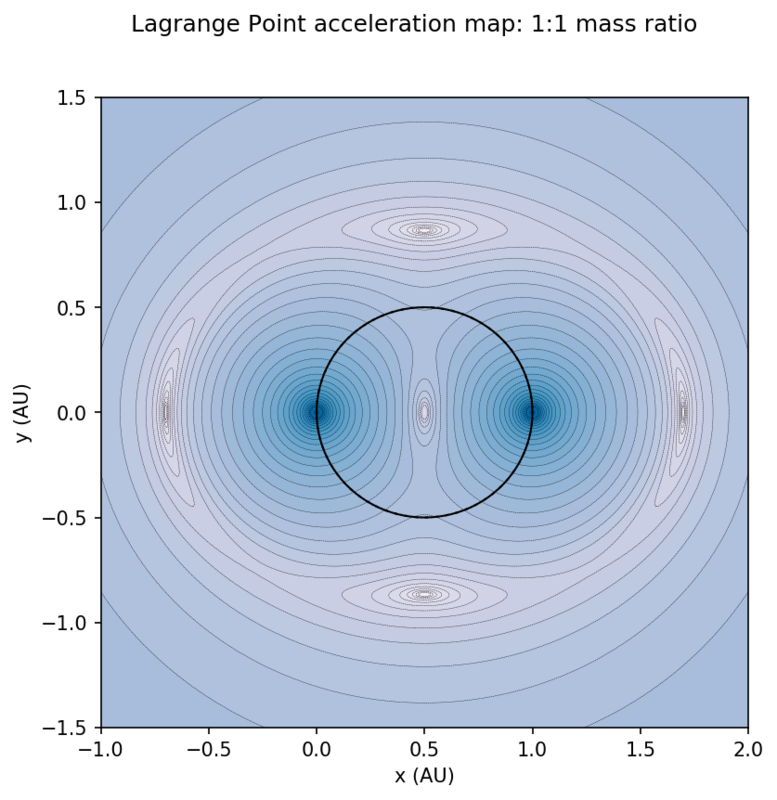 Motions around the Lagrange points will also be much easier to visualize and interpret. But, seeing as how much I myself struggled when I was learning about non-inertial forces in rotating frames of reference, I think a quick digression into that subject would be a good idea. Most of us are comfortable with physics in "inertial" frames. An inertial frame is one in which objects subjected to no forces will move in straight lines with constant speed due to inertia. In other words, an inertial frame is one in which the "law of inertia", or Newton's First law, is valid. But what if we put ourselves on a turn table, and try rolling a ball back and forth to each another? We will discover it is quite hard -- the ball will seem to be deflected by some mysterious force. Someone watching from the side will still say the ball moves in a straight line relative to the ground. It is us on the spinning turn-table that accounts for the weird trajectory we see. However, we can be just as valid in saying that the ball is deflected by something. We may invoke new forces, unique to our rotating frame. There is a centrifugal force which tends to fling things away from the axis of rotation, and a Coriolis force which tends to make moving objects turn and follow curling paths. We all have felt centrifugal force whenever riding in a car going around a turn. And many are probably familiar with how Coriolis forces on the spinning Earth causes air currents to deflect, and explains the rotation of hurricanes. These forces are sometimes said to be "fictitious", in the sense that there is no real physical interaction responsible for them. They are simply consequences of being in a strange frame of reference. But when we are in that reference frame, they seem totally real. -The first 13 minutes build the ideas of different frames of reference. -13:25 to 17:00 looks at non-inertial (accelerated) frames. -17:04 is a beautiful example of motion in a rotating frame. This segment is extremely relevant to the physics we will be looking at here. Here we go! Let's imagine two masses in orbit around each other, and examine the forces and the potential they produce. For starters, and for symmetry, let's first let the two masses be equal. We will also "lock them in place", so that (for now) there are no non-inertial forces. What does the potential look like for this system? where r with a hat over it means "in the direction from the mass to the point in question", since force is a vector, like an arrow, which has magnitude and direction. The minus sign in front flips it around so that it points to the mass. This expression lacks any vectors, since each point is assigned only a magnitude (a height in the landscape). What does this landscape look like? Below I plot it for the two equal masses, 1 unit apart along the x axis, fixed in place and centered around the origin. Darker/redder colors indicate more negative values of the potential. Around each mass is a bottomless hole. Drop a ball into this landscape, and it will fall into the hole associated with the nearest mass. As FFT has said earlier, the steepness of the potential (how closely packed the contour lines are) relates to the magnitude of the force at that point. On a topographic map, close lines means steep terrain. A ball on steeper terrain will accelerate down the hill faster, and likewise a particle on a steep region of a potential will experience greater force. To help see how the potential and the force/acceleration are connected, below I'll plot the exact same situation in terms of the acceleration. I'll plot on a log scale, so that details at very small accelerations are visible (whereas on a linear plot they would be overwhelmed by the very large accelerations close to the masses). 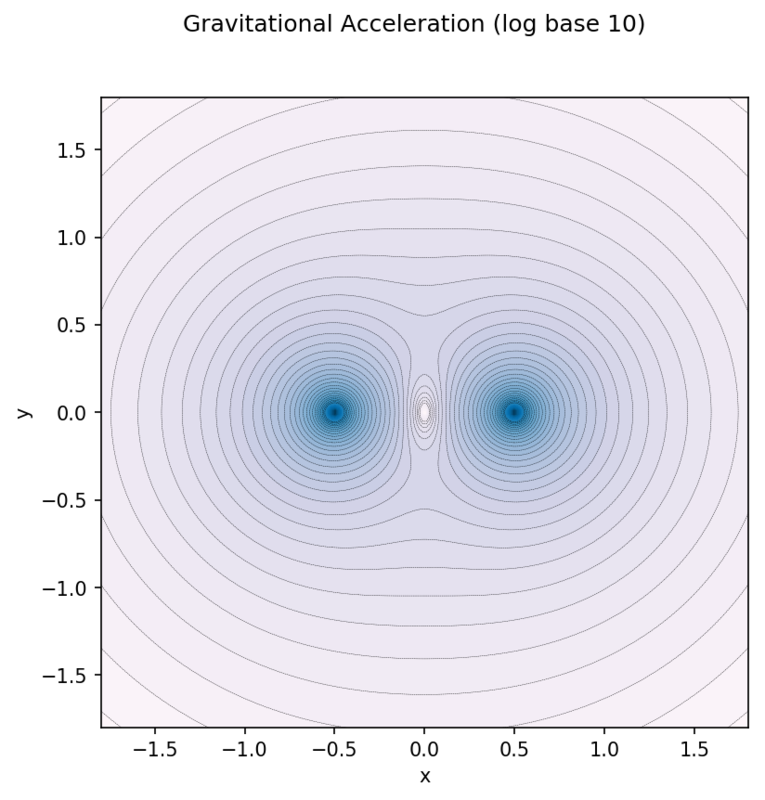 Here, darker blues represent greater acceleration. Unsurprisingly, near the origin the acceleration drops to zero. There the gravitational force due to the mass at the left exactly cancels the force due to the mass on the right. We can also see a hint of this from the potential. This location is a "saddle point", where the landscape rises up if we move along the y axis, but drops down if we move along the x axis. Trying to balance an object here would be very difficult, with a tendency for it to "roll off". The Co-Rotating Frame: how do non-inertial forces modify the potential? Now let's set these two equal masses into a circular orbit around each other, and place ourselves into a rotating frame of reference, such that the masses appear to stay still. What new forces appear, and how do they affect the potential and the motions? where r is the distance from the point of interest to the center of mass of the system about which the frame is rotating. The r-hat in this equation tells us the centrifugal force is directed away from the axis of rotation, as it should be. The strength of the force also grows in proportion to the distance from the center of the frame, and also with the square of the angular speed that the frame is rotating. Let's see what this looks like now, again for the two equal masses. Now the masses are orbiting in a circle, and we are in a frame which rotates with them. There they are! Five points where the net force is zero! One is in the exact center as before, where the gravitational forces cancel and the centrifugal force is zero since it is at the center of rotation. 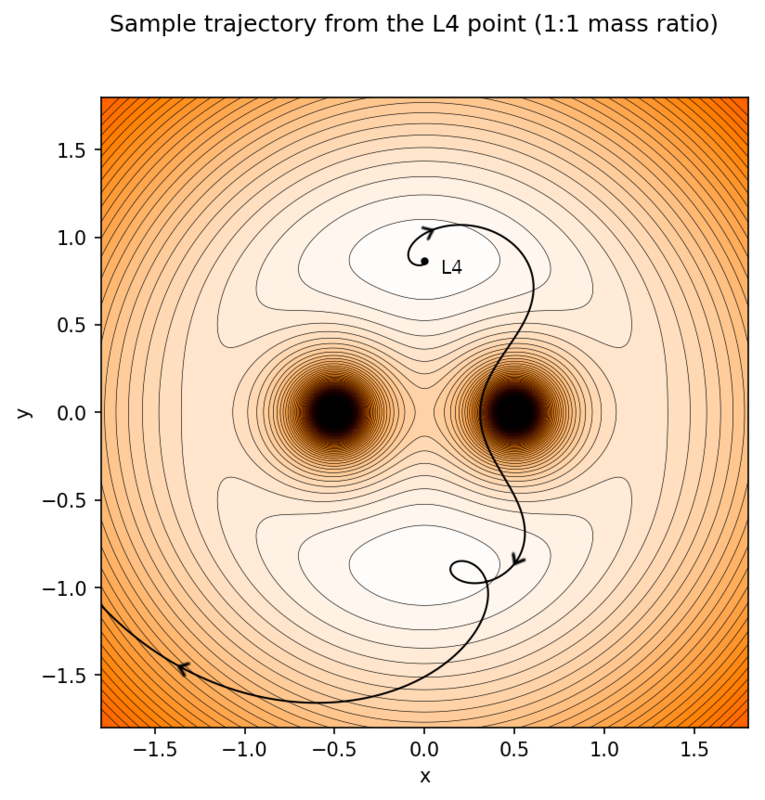 This is the L1 Lagrange point, in the case of the two masses being equal. Two new points are added on either side of the masses. These are L2 and L3. Here the centrifugal force is exactly equal and opposite to the sum of the gravitational forces. In the potential they also look like saddles, and are unstable. Finally, two new points are added above and below. These are L4 and L5, where again the centrifugal and combined gravitational forces cancel. You might notice that the inclusion of centrifugal force makes the potential drop down again at large distances, whereas with gravitation alone, it rose upward. This is because if you start out far away from the center, and match your speed to rotate along with the system, then you are moving quite fast, and have far too much angular momentum to be in a circular orbit. Your side-ways speed will carry you off to larger distances. On the other hand, if you start out too close, then you have too little speed to be in orbit and so you drop closer in. Wait, what? Why did it spiral away? The cross (X) product between Ω and v means that the direction of the force is given by the right hand rule, and then we flip the direction 180° because of the minus sign in front. So if the frame of reference is rotating counter-clockwise, then the force on a particle moving upward will be to the right. That is, it will deflect trajectories clockwise. This is also why high pressure systems (air flow away from center) spin clockwise in the northern hemisphere, and why low pressure systems (air flow toward the center) spin counter-clockwise. Because the Coriolis force is velocity dependent, it is impossible to define a potential for it. If we move faster, the force will be stronger, and we'll take a different path, with a different change in potential energy. So there is not a unique landscape that we can use to model motions subject to this force. 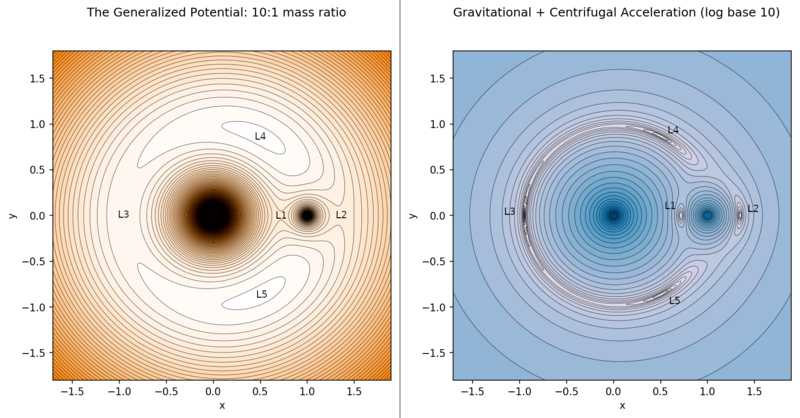 Instead, we can model the general potential with just gravitation and centrifugal force, and to simulate motions we can include the effect of Coriolis force by direct computation on the computer. This is how I generated the above plot. In the case of the masses of M1 and M2 being equal, the particle dropped near L4 slides down the potential hill, and then as it speeds up, the Coriolis force whisks it around in a growing spiral. There are no stable orbits around any of the Lagrange points in this scenario. In order for L4 and L5 to be stable, one of the masses must be at least 24.96 times the mass of the other. Understanding why this is the case (or why this number in particular) is hard, and requires a careful analysis of the equations of motion. If any readers are interested in the mathematical details, I can refer you to some suggested reading at the end. But for our purposes, let's just take it as an established fact. What we can do is look at more examples of the potential where we vary the mass ratio, check what happens visually, and see if we can qualitatively make sense of it. Let's set the mass of one object to be 1/10th the mass of the other. The acceleration plot is particularly illuminating. 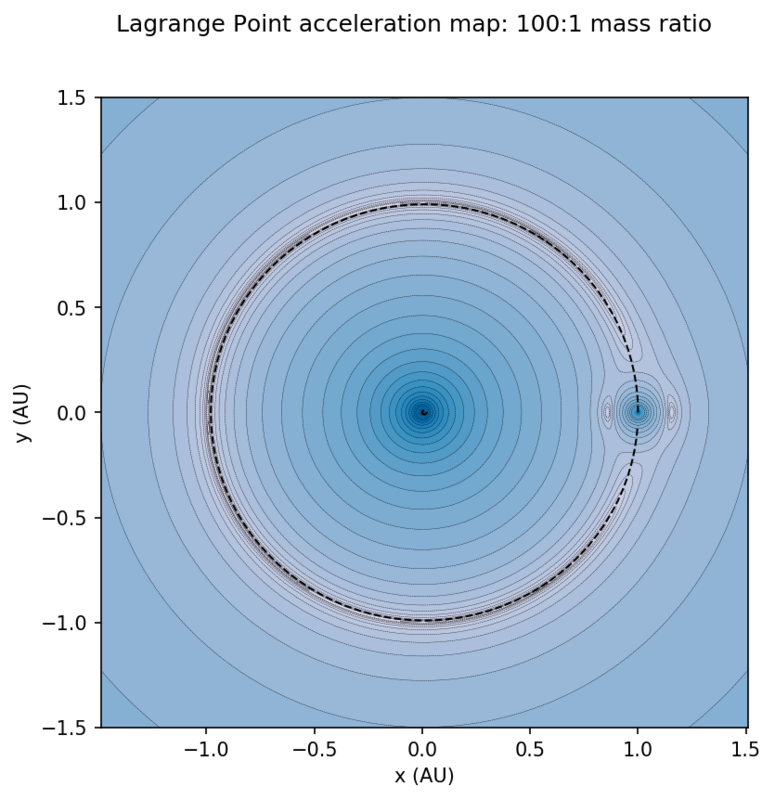 The Lagrange points are starting to look a lot like their commonly-shown configuration, with L4 and L5 leading/lagging the secondary mass by 60°. This 10:1 ratio is often used in figures that portray the Lagrange points for the Sun and Earth. Which is an exaggeration of truth, because Earth is of course much less than 1/10th the mass of the Sun! But it strikes a nice balance, giving an idea of the shape of the potential for the Sun and planet. Using the true mass ratio of Sun and Earth would be quite unhelpful for visualizing it, as the Sun's influence dominates the landscape. Finally, let's increase the ratio to match the Sun and Jupiter. That is 1047:1 -- definitely enough for L4 and L5 to be stable. And since this is a real situation with specific masses and distances, I'll add in units. The potential is in terms of energy, here shown in gigajoules per kilogram. Distances are in AU. It's pretty hard to see the details here (again why most figures online show 10:1 instead of the real thing). Even the log-scale acceleration plot isn't terribly useful. 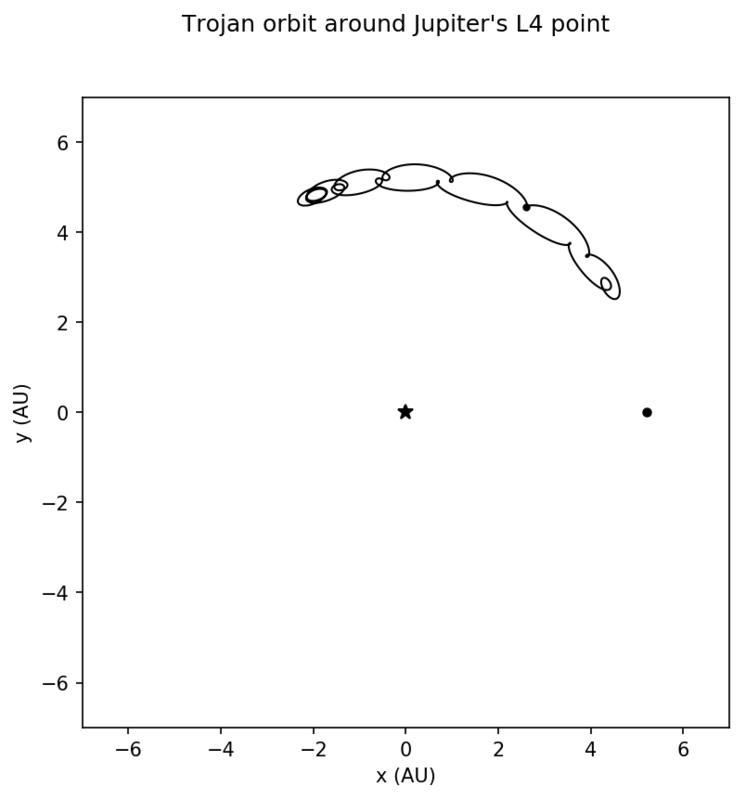 But we can at least see that the potential in this case has a crescent ridge along Jupiter's orbit, with Jupiter making a small depression around itself. The L1, L2, and L3 points still exist and are saddle-shaped, but they are not visible in this plot scale. Similarly, L4 and L5 are still separate hills along the crescent, but we can't distinguish them from one another. Let's zoom in to the area around L4, and drop in a particle again. Here I said "WOW!" 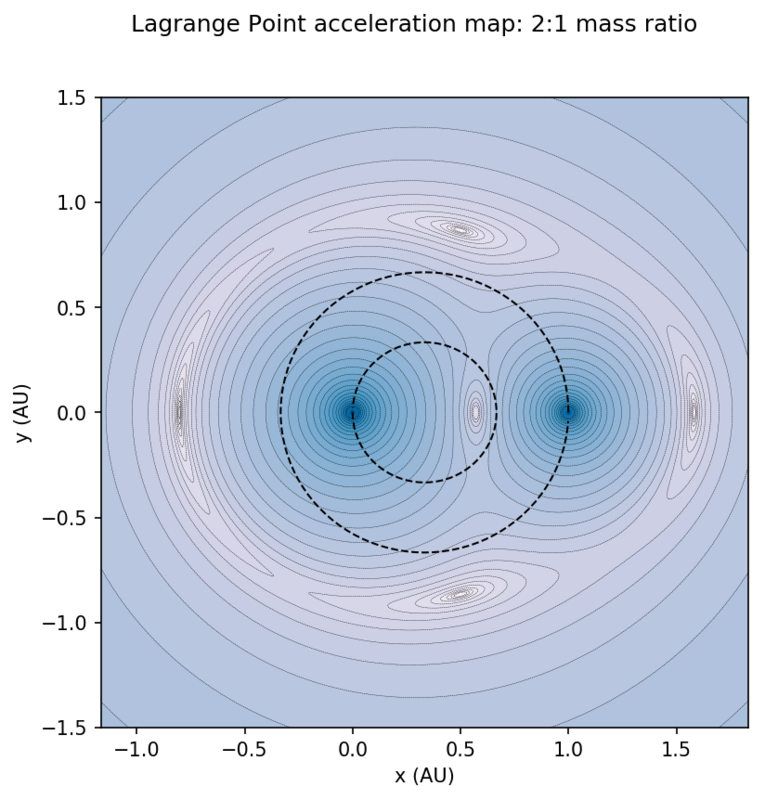 I had no idea that the orbits around Lagrange points look like this. But they do -- spiraling about in these crazy elongated paths. I was extremely surprised and excited when the computer output this trajectory. These orbits are known as "Trojan orbits". As mentioned before, they have enormous astrophysical significance, and in fact many asteroids are caught in them, especially around Jupiter's L4 and L5 points. One has also been found in a Trojan orbit of Earth! Here is an even larger one (starting farther away from the L4 point), with an overview including the Sun and Jupiter but without the mess of the potential. As a sanity check, I went to the literature. 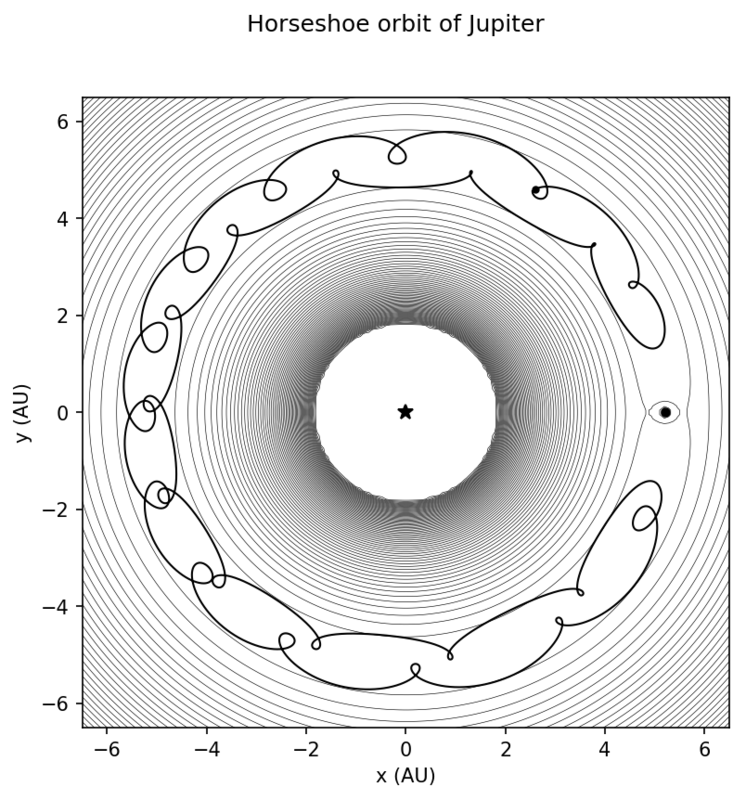 Check out Figure 3 from this paper "Horseshoe and Trojan orbits associated with Jupiter and Saturn", by Everhart, 1973. A very close match! How can we explain this behavior, qualitatively? As before, when the particle slides down the potential hill from the Lagrange point, Coriolis force whisks it aside, turning it clockwise. But soon it is turned so much that it rises back up the potential hill, at a location farther along the orbit -- either closer to or farther from Jupiter. As it rises up the hill it slows down again, the Coriolis force weakens, and the arc shrinks. Then the process repeats -- falling down the well, getting deflected to the side by Coriolis, and so on. But the shape of this potential hill is a like a very broad crescent. Farther away from the Lagrange point, it gets thinner, and a little less high. This means the particle has an easier and easier time rising back up to the top of the "ridge". Finally it reaches a point where it is able to cross over the ridge, and the process repeats on the other side! It is the Coriolis force that keeps the particle circulating around near the top of this potential hill -- with the hill itself being generated by gravity and centrifugal force. 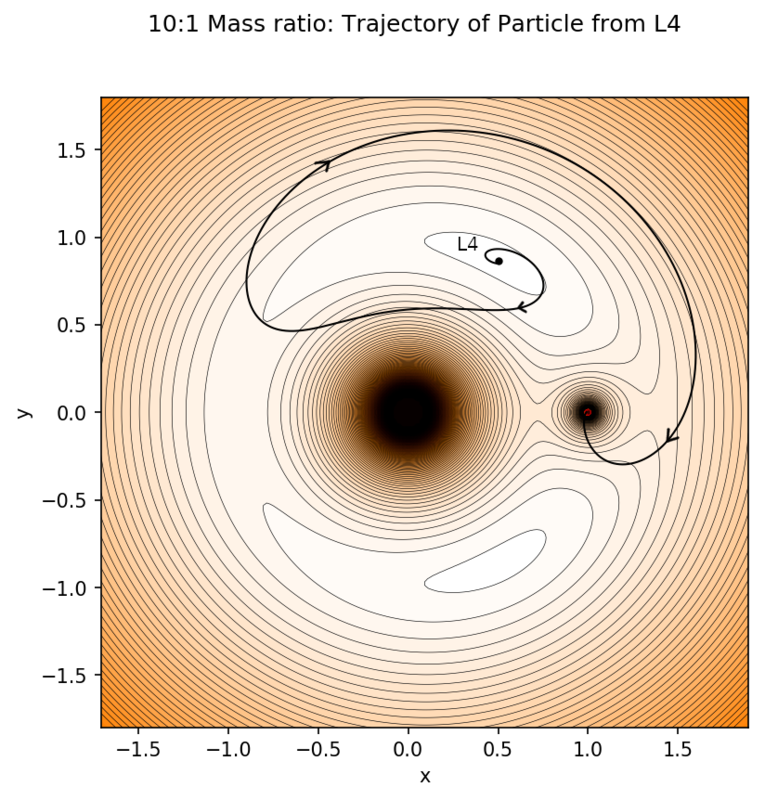 For larger deviations from the L4/L5 points, the particle will spiral along more and more elongated paths. Once the departure gets too large, it can even cross over to the other side of the Sun-Jupiter line. Now we have Horseshoe orbits! Some asteroids are known to be caught in these orbits as well. I think I will end it here, as I think this has covered all (and more!) that I had hoped to go through. I myself have learned an enormous amount while working through this, and came across many surprises and previous misconceptions. I did not know for example that L4 and L5 are actually repulsive, and that the stability of orbits around them depends on the Coriolis force. 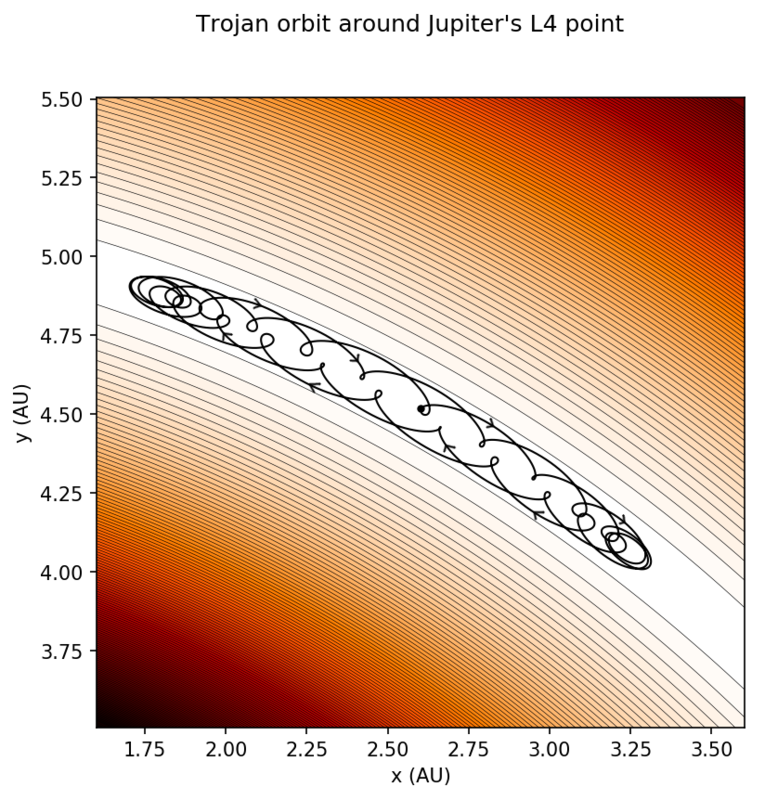 Nor did I really have a sense of what Trojan orbits really look like or why they behave as they do. This was extremely exciting to work through and discover, and I hope you all find this an interesting and enjoyable exercise as I did. I will also be away from the forum for a while as I go on a road trip. I should be back by the end of July. 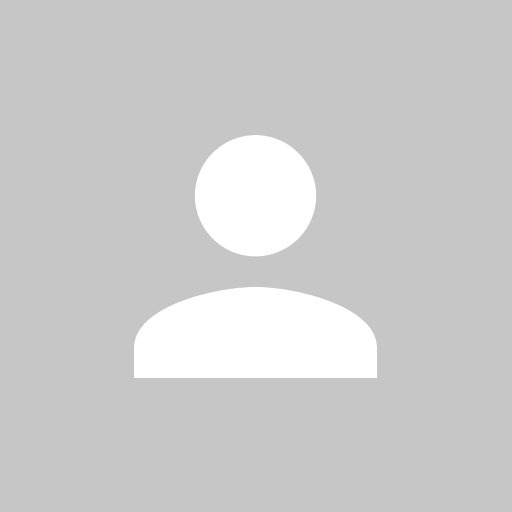 An excellent, more technical treatment of Lagrange points, including deriving them and calculating their stability, can be found here. (written by Neil Cornish of Montana State University). Another good one can be found here from Tipler's Modern Physics text. For those interested in a broader scale of classical or celestial mechanics, including deriving equations of motion in non-inertial frames of reference, I can highly recommend the text "Classical Mechanics" by John Taylor. Wow. I need to read this again when I have more time. A question: If the bodies are really massive (merged?) black holes, could the slopes down from L4 and L5 be so steep so these points become a kind of massless "white" hole? midtskogen, that is an amazing question. Off hand, my gut feeling is that it cannot, but I do not know for sure! I will like to investigate this and try to get back to you when I have the opportunity. Where is the Lagrange point L3? or in an orbit with Earth and the L4 and L5 points? Oof, that's definitely a point of confusion. In fact, both of those graphics are misleading. They show the contours of the potential and location of the Lagrange points as if the Sun was only about 10 times the mass of Earth. (They do this so that the way the Lagrange points are related to the shape of the potential is more apparent). But for such a close ratio of masses, the center of mass about which both masses orbit should be noticibly displaced from the Sun. So they really should not be showing Earth's orbit as if it was centered on the Sun. This leads to the wrong positions of the Lagrange points relative to an orbit. Let's check the real thing. I'll use the gravitational + centrifugal acceleration (again in log scale), where the Lagrange points appear as the lightest colored spots. I add dashed circles to represent the path of both masses around the center of mass, which is at the center of the figure. If we were to view the motion in the non-rotating frame, then we would see all the Lagrange points moving in a locked formation with the masses, and the masses will move about those dashed paths. Basically the whole picture would just rotate about the center. Let's start with the 1:1 ratio, for which the orbits overlap exactly, then increase to 2:1, 10:1, and finally 100:1. For nearly equal masses, the L2, L3, L4, and L5 points are all well outside of the orbits. As we increase the mass of one over the other, then center of mass shifts closer to the larger mass, the orbit of the larger mass shrinks, and L3, L4, L5 all move closer in to the orbital path of the smaller mass. 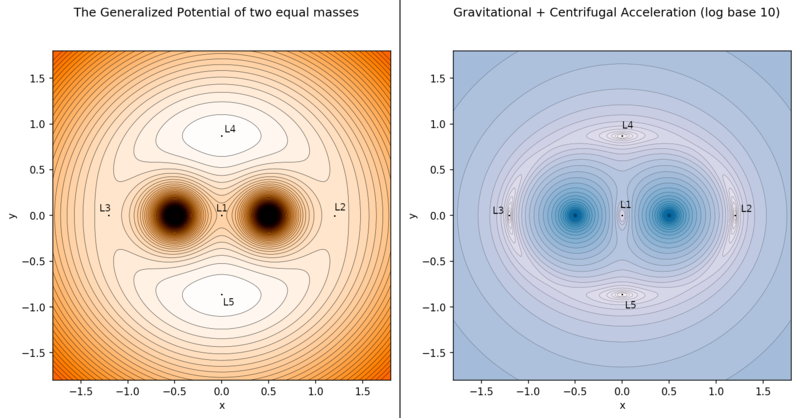 L1 and L2 also shift closer to the smaller mass itself. So for something like the Earth orbiting the Sun (very large mass ratio), L3, L4, and L5 are all "pretty close" to the orbital path of Earth, since the center of mass is pretty close to the center of the Sun. But they are all actually slightly outside of it. One other thing to add real quick, and then this will be the last for a while. 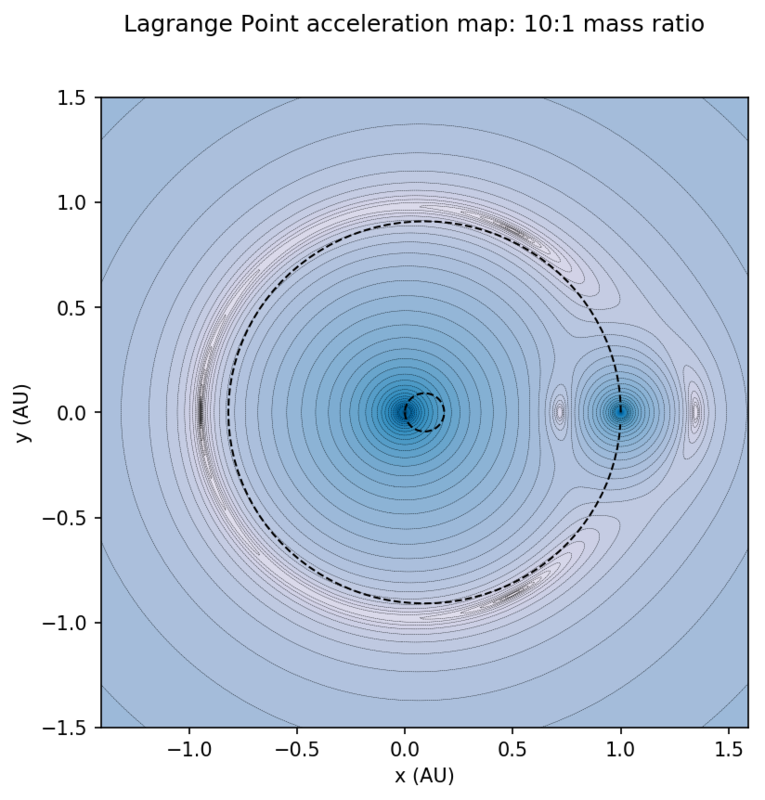 I wanted to show that it is also possible to orbit around the unstable Lagrange points (L1 for example), but the orbit is extremely delicate and will fall apart if not carefully maintained. 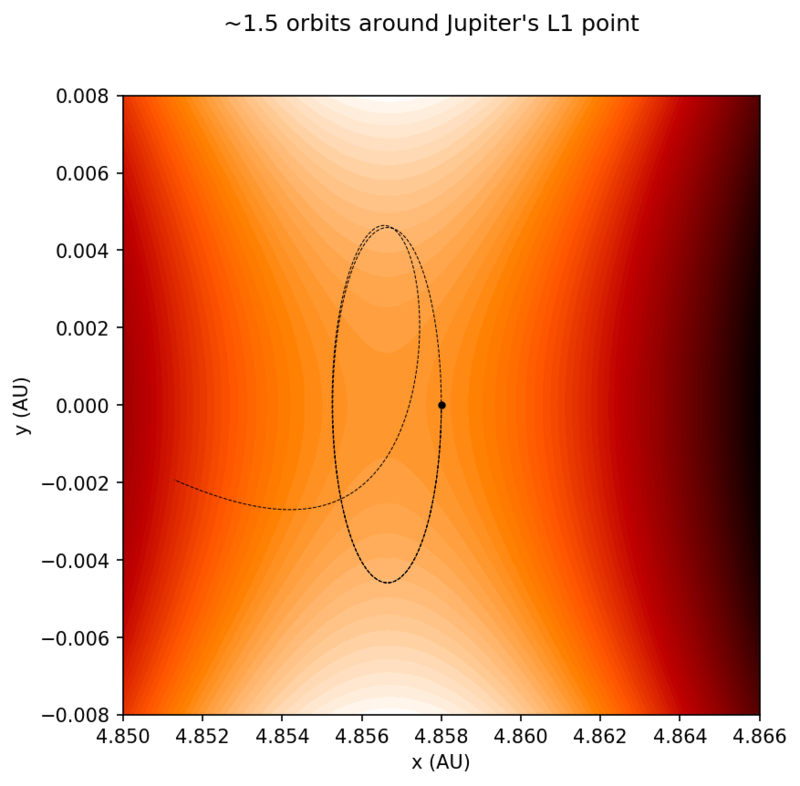 Here it is For Jupiter's L1 point. The particle starts out a little bit closer to Jupiter than the L1 point, and with an initial velocity downward. Coriolis force deflects its path clockwise, and with the initial position and velocity tuned "just right", it ends up circulating in an oval. For the values I chose, it completed about an orbit and a half before falling apart. To give an idea of the timing involved, this path is plotted over 12.5 years, and the first orbit took about 5.5 years. Plenty of time for a spacecraft trying to follow this course to make necessary adjustments to stay on it. This has actually been done with missions to Earth's L1 and L2 points. Here is the path the LISA Pathfinder used to get to and orbit around the Earth-Sun L1 point. Again some maintenance is required to follow this orbit. I think for my purposes, the orbits of L4 and L5 are close enough to Earth's orbit. I just wanted to know if I had to take the same distance from the sun for L3 as for L4 and L5, or the same distance as for L1. (Is for my addons.) Thank you! A related question, what can we say about Lagrange points within the Swartzchild radius - would they create time loops in which things actually could get stuck, avoiding the singularity? But the sources of the points are destined for the singularity. I can't wrap my mind around this. I think there can not be any Lagrange points within the Schwarzschild radius. To have Lagrange points within the Schwarzschild radius, a mass within the radius would have to orbit the 'singularity'. Perhaps, if a mass orbits the black hole very close to the radius, could the L1 point possibly be within the radius?